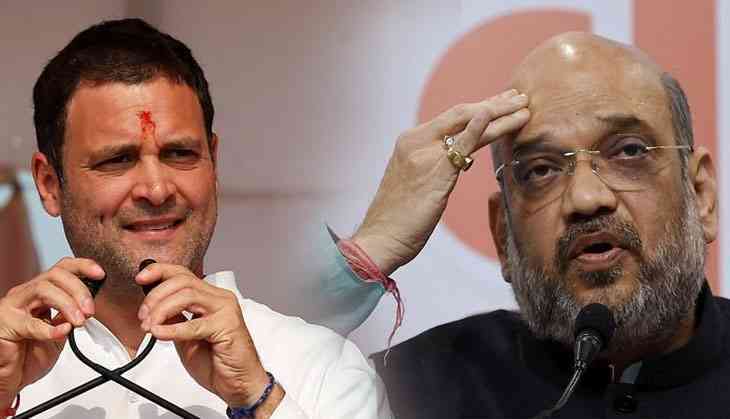 Taking a dig at Rahul Gandhi over his push for a JPC, Joint Parliamentary Committee, probe into the Rafale deal, BJP president Amit Shah described JPC as 'Jhoothi Party Congress" and said the Congress chief's "lies to fool the nation are self-evident". In his reply on Twitter tagging Gandhi's tweet in which the Congress leader had attacked Finance Minister Arun Jaitley over his defence of the Rafale deal negotiated by the Modi government, Shah said Gandhi had quoted different prices of the aircraft at different places. "Your lies to fool the nation are self-evident when Rafale price you quote vary in Delhi, Karnataka, Raipur, Hyderabad, Jaipur & Parliament. But the nation's IQ is higher than yours!" Shah tweeted. To Gandhi's demand of a JPC probe and sarcastic suggestion to Jaitley to revert in 24 hours, Shah retorted, "Why wait 24 hours when you already have your JPC-Jhoothi Party Congress." Earlier, Gandhi had tweeted following Jaitley's interview in which he had put up a strong defence of the Rafale fighter aircraft deal, saying "Mr Jaitley, thanks for bringing the nation's attention back to the GREAT #RAFALE ROBBERY! "How about a Joint Parliamentary Committee to sort it out? Problem is, your Supreme Leader is protecting his friend, so this may be inconvenient. Do check & revert in 24 hrs. We're waiting!" Shah also tagged the link of a news story about Gandhi quoting different prices of the aircraft.